As we celebrate Cantley's 25th anniversary we should remember the determined men and women who worked so hard to bring about our independence in 1989. 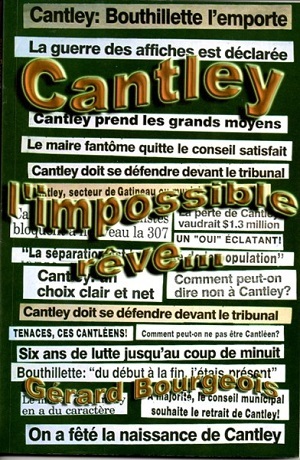 The late Gerard Bourgeois' book, Cantley l'impossible rêve documents the six year battle to separate from the City of Gatineau and is a must read to understand the spirit of Cantley. The story starts with the famous tax revolt meeting of March 10, 1983 which saw the birth of the separation movement. It documents the car blockades on the Highway 307, the citizens holding their own referendums, electing a Shadow Council, and the intense lobbying. It is a fascinating story of how a small community would not take "no" for an answer and fought Goliath and won. The book is available from Cantley 1889 for $15. Contact info.cantley1889@gmail.com.